This table’s shape encourages interaction and conversation. The uniquely curvaceous shape of the Afton is inspired by the river in Scotland, and its design will inspire you as well. 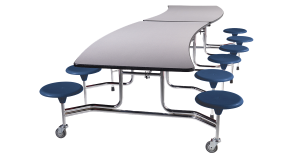 The table’s ebb and ﬂow facilitates interaction, making it ideal for cafeterias, food courts, breakrooms, meeting areas and more.